گائوزو(در چینی:高祖، وید-جایلز: Kao Tsu)(زادهٔ ۲۵۶ یا ۲۴۷ پیش از میلاد- مرگ ۱ ژوئن ۱۹۵ پیش از میلاد) بنیان‌گذار دودمان هان و فرمانروای چین از سال ۲۰۲ پیش از تولد مسیح تا سال مرگش بود. نام راستین وی لیو بانگ بود. وی از انگشت‌شمار بنیادگذاران در تاریخ چین است که از طبقه‌ای فرودست برخاست. Liu Bo, Duke of Huai. Liu Xi, Prince of Dai. Liu Jiao, Prince of Chu. ملکه لو, bore Liu Ying and Princess Lu. Consort Cao, bore Liu Fei. Consort Qi, bore Liu Ruyi. Consort Bo, bore Liu Heng. Consort Zhao, bore Liu Chang. شاهزاده لیو فی, Prince Daohui of Qi. لیو یینگ, Crown Prince, later Emperor Hui. لیو رویی, Prince Yin of Zhao. لیو هنگ, Prince of Dai, later Emperor Wen. ↑ تایزو, meaning "grand ancestor", was apparently Liu Bang's original temple name because "Taizu", in ancient Chinese traditions dating back to the دودمان شانگ، was the temple name of the founder of a dynasty. ↑ Sima Qian referred to Liu Bang as "Gaozu", meaning "high ancestor" in the Records of the Grand Historian. It is not clear why Sima Qian used "Gaozu" instead of "Taizu". Historians after Sima Qian often used "Emperor Gaozu of Han" to refer to Liu Bang. "Emperor Gaozu of Han" remains the most commonly used title to refer to Liu Bang in modern China. ↑ This is the birth year reported by Huangfu Mi (皇甫謐) (215–282). ↑ This is the birth year reported by Chen Zan (臣瓚) in around 270 AD in his comments in the Book of Han. 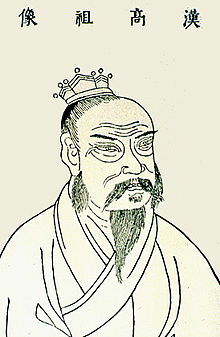 Wikipedia contributors, "Emperor Gaozu of Han," Wikipedia, The Free Encyclopedia, http://en.wikipedia.org/w/index.php?title=Emperor_Gaozu_of_Han&oldid=416172148 (accessed February 28, 2011). این صفحه آخرین‌بار در ‏۲۰ دسامبر ۲۰۱۸ ساعت ‏۱۷:۵۸ ویرایش شده‌است.